Nominations are currently being accepted for the 2018 Special Needs Awards in recognition of the abilities of those with special needs and those who support them in the Archdiocese of Detroit. 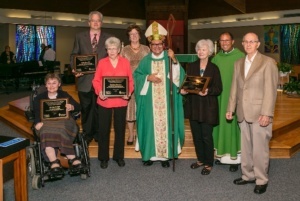 The awards will be presented during the 2018 Mass for Special Needs Ministry on October 14, 2018. The annual Mass takes place at a different parish each year, and for 2018 it will take place at Our Lady of Victory Parish in Northville. All are welcome to attend this celebration. A blessing will be given to caregivers and those with special needs. Click here for the Award Criteria and here for the Nomination Form. Completed forms should be emailed to Joyce Hyttinen at hyttinenj@ccsem.org or mailed to her attention at Catholic Charities of Southeast Michigan, 15945 Canal Rd., Clinton Twp., MI 48038.